I think all that work in grad school doing mixing problems on North Atlantic Deep Water and Antarctic Bottom Water and all those other specific named masses of water in the ocean makes me believe that air can behave the same way. Sonar is affected by the refraction of these layers of the ocean so I can easily accept that shock waves could create refraction on an order that would produce optical effects in the sky. So time to make a video. I'm going to assume that a shock wave would perturb this interface between the denser cold air and the lighter warm air just like dropping something in a pool of water disturbs that surface. I want to simulate the rocket's presumed 11 shock waves. I decided to use 11 airgun pellets inside a straw to create this effect. Of course on such a small scale it's going to have to be really slowed down for us to see anything. I shot it at 210 frames per second. That got me close to one frame per pellet. 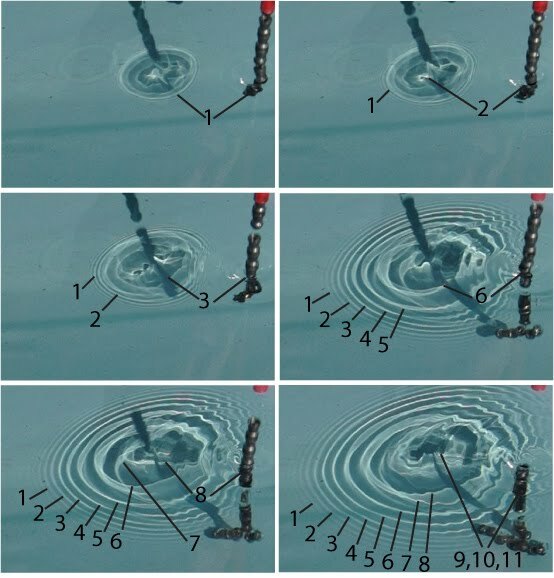 Ripple Tank Demonstration of Sonic Boom meets Sun Dog from Barbara Tomlinson on Vimeo. I isolated individual frames to see if that numbering each wave thing seems valid. Right off the bat you see that as the first pellet hits the water there are multiple visible rings in the shadow. I don't believe that one shock wave equals one sine wave. There is a point where it is very tempting to count them off as they are so orderly, but then it just sort of goes chaotic. This wouldn't be such a problem with a supersonic vehicle though. It's heading into clean air. My water was pretty jumpy by the time all the pellets were wet. In retrospect I suppose I should have counted each pellet as two shock waves -- the front breaking the water and the back where the water closes over it, but some off them fell kind of stuck together. But the demonstration still shows a few useful things. 2. The continuing movement of the fluid (and air is a fluid) after the original disturbance is gone. It has to boing back and forth a bit to dissipate the energy and regain equilibrium. Now since this is basically a demonstration of Snell's Law I have to put in a link. All the stuff on wikipedia and the other sites is just very dry and no fun. But I found a SONG about Snell's Law that really cracked me up. I'm gonna have "n one sine theta sub one hey hey hey equals n two sin theta sub two hip hooray" stuck in my head all night now. How much money do I need to live?